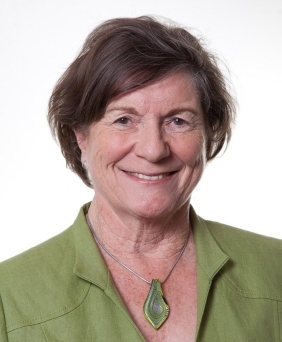 A talk by Dr. Jenny Tonge. Thursday 24 January. 7 - 9 pm. [Between Cafè Nero and The Body Shop]. Why we had to change the venue: full story here. 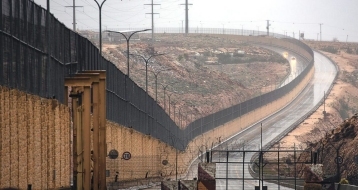 Israel's new 'Apartheid Road' opens, Separating Palestinians and Jewish Settlers (Route 4370, image left). Segregation in Israeli maternity wards. Israeli maternity wards, Jewish and Arab segregation Is the default. (From May 2018). Knesset approves 200 communities where Arabs are banned. From the people who should know best: South Africa tells UN: Israel is only apartheid state in the world today. We've sent in 26 sheets of petition signatures: "We the undersigned, support an end to the mistreatment of Palestinian children in Israeli military detention and for the rights of Palestinian children to be upheld in accordance with international law." Thanks to everyone who has signed. The online version is here: End the mistreatment of Palestinian children in Israeli military detention. 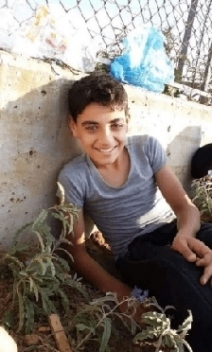 First Palestinian child killed by Israeli forces in 2019, 13 year old Abdel-Raouf Ismail Mohammad Salha (Photo, right). was struck in head with tear-gas canister. Israeli Border Police seize 6-year-old in Hebron, drag him to a checkpoint, and hold him for an hour. Israel refuses vaccinations into Palestine: No Vaccinations for Palestinian Children. The case of Mahmoud Kheireddine. How Israel used a fake 'humanitarian' group inside Gaza; and how a Palestinian, even when he served in the IDF, was still only regarded by Israel as a second class citizen. Palestian Mahmoud Kheireddine was killed serving as an IDF commando in Gaza. While Housing Minister Yoav Galant was attending the mourning tent, Kheireddine's father denounced him: "My son gave you his life, but you were too miserly to give him a building permit!" Israeli Commando Operation Exploited Gaza Humanitarian Relief NGO as Front. The young Israelis imprisoned for refusing to serve in the IDF. Israel to seize 34 acres of land in Ramallah for settlement. Israel demolishes statue of Palestinian novelist Ghassan Kanafani. "Price Tag", Settlers continue to wreak havoc in Palestinian communities, shielded by military and police. Dozens of Palestinian olive trees destroyed by Israel's settler gangs. Seven decades after Resolution 194, why haven't Palestinian refugees returned home? Dramatic Rise In Number Of Idf Soldiers Reporting Sexual Assault. Christians no longer welcome in Israel, says Palestinian group. Israel spraying herbicides inside Gaza violates international law. Who gets to vote in Israel's version of democracy in 2019. Palestine in Pictures: December 2018. 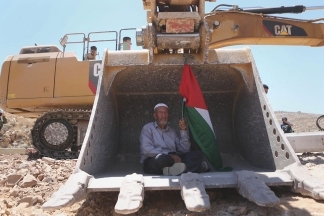 Israeli army razes home of prominent Palestinian activist. Meet the Israeli and Palestinian teenage girls risking jail time to be friends - and to march for peace in the region. Israeli Colonialist Settlers Invade The Area Surrounding St. Saba Monastery In Bethlehem. Dutch ministry calls on Jews around world to criticize Israeli occupation. Birmingham Civil Rights Institute under fire for rescinding Angela Davis honour. 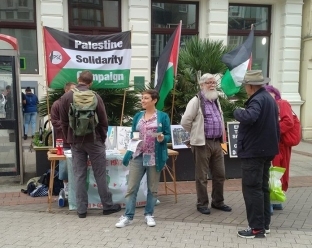 USACBI condemns British Labour Party's adoption of IHRA's "antisemitism definition." Americans Are Increasingly Critical of Israel. YouGov polls show anti-Semitism in Labour has actually reduced dramatically since Jeremy Corbyn became leader. (March 2018). Scotland may be dropping the IHRA definition of anti-semitism. Pro-Israel lawyer sanctioned for smears against Scottish PSC member. 18 Highlights of BDS Impact in 2018. Strategic Affairs Ministry To Form Anti-Bds Legal Network.